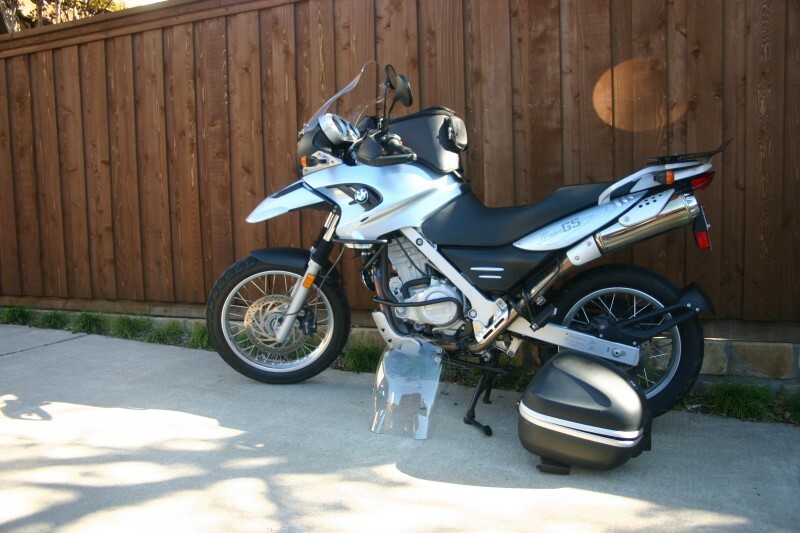 So long story short, we sold all the bikes and put a deposit on a sweet 06’ BMW F650GS we’d been eying for awhile out in TX. The plan was to go the very next weekend, pick it up, most likely by car/truck and bring it back. So that night I go to bed, too excited to sleep. Knowing I’m finally getting my dream bike. The next morning I wake up early and Dan says “You know, there’s a flight leaving this morning that’ll get you there around 11:00.” I just laugh and head off to have my coffee. Needless to say, a mere 2 cups of coffee later, and we had booked my flight, packed my helmet and extra liners in a duffle bag, loaded the ipod and headed to the airport. It was only 8:00 our time, so we hadn’t contacted the bike’s owner to let him know I was on my way. He still thought we’d be out next weekend. We also hadn’t secured a ride for me from the airport, to this guys house 40 minutes north of the airport. Mere details that could be worked out later, for now, I was on a mission….. I wore most of my gear to the airport and arrived only an hour before my flight was to leave. As I was waiting in the security line, I came to the conclusion that the airport must be a lot like New York City. You can dress however you like and nobody looks at you or talks to you, everyone is just focused on getting to where they’re going on time. In fact, in case you were wondering, security didn’t even look at me or the contents of my bag twice. Guess people show up to the airport in strange garb, carrying helmets in duffle bags, all the time. Huge sigh of relief. Things were going way too smooth. I had a ride, the guy knew I was coming and the weather was great! Which my driver told me was not typical Texas weather. I arrive at the guy’s house and find the bike gassed up and ready to go. Actually, it was more than just gassed up, he had it plugged into a charger, had checked the air pressure in the tires, packed me two bottles of water in the tank bag along with a terry cloth towel, printed out a map of my route back to I-20 and even reset the bike’s clock to Eastern Time. HUGE Thumbs up!!! If only every buyer was this great! Here’s the bike with all her goodies. Dan had outfitted me with our Spot tracker and I had turned it on upon leaving the airport so he could follow my progress. Little did I know, everyone would be following my progress as well. I had refused to take a GPS because I-20 was pretty much a straight route from TX to Ga. In hindsight however, it might have been useful to give location should I have broken down. When you’re traveling interstate, you tend to forget what exit you just passed pretty quickly. Up to this point, I always thought that conversation was an urban legend. I thought everyone knew about BMW.. I found I-20 without any problems and was on my way. I usually only do about 100 miles at a time, before taking a break, but there were two issues making me put in the miles. First, I wanted to make as many miles as possible before nightfall, so my next days ride would be shorter. The second was that the bike had a battery that was on its way out and was getting increasingly slower to start. A problem we knew about ahead of time, but had decided it would wait until we were home to be replaced. So, the less times I shut it off and started it back up again, the better. 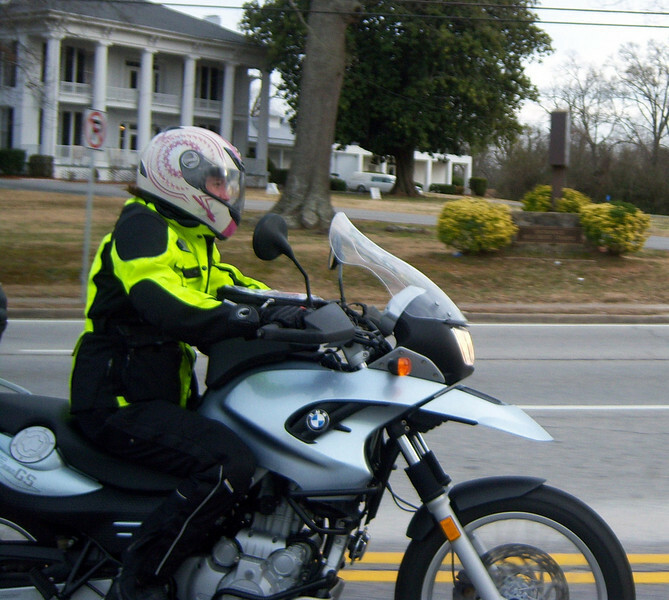 There’s nothing like an 800 mile trip to let you get to know your bike intimately. First, I was a little concerned that I’d miss my 650r’s power. But let me tell you, this bike is no slouch. It took off like a whip and was actually difficult to keep around 80mph. It kept creeping up faster. And it just hums along around 4500-5000 RPM’s. As you can see, redline is around 8,000, but I never got close. So the power was great, the windscreen, not so much. It has an aftermarket one that seems “just” too short. Like you can’ decide to look over it or through it. And it curved to direct the wind straight into your shoulders. Not real comfy at 80mph. The seat, it turns out, is also only good for about 100 miles. Any time spent on it after that and you’ll soon be paying for it in a most uncomfortable way. No worry’s, I think Spencer’s seat mods in Fla. Could do it some good. I had grabbed McDonald’s on the way to the guy’s house, so I knew I only had to stop for Gas and potty breaks. I planned to keep them in the same stop. The first 100 miles flew by. The seat has a wide sitting area that I could actually sit back in and it’s good….for 100 miles. Another 100 miles later and my fuel light came on. I had no idea what kind of gas mileage I was getting, so didn’t want to push it. Both literally and figuratively speaking. I checked in with my hubby, gassed up and kept the bike where I could see it when running into the store. I didn’t want to leave it alone for long. I think the Beemer is making me paranoid. Break over I turn the key, wait for all the flashing lights to go out, turn on the power button, wait for more lights to stop flashing, and hit the start button. She’s slow, but eventually turns over. Huge sigh of relief and I’m back on my way down the endless straight of I-20. A hundred miles later and I was in Louisiana and ready for another break. I didn’t need gas this time, so I just parked in front of the store and ran in real quick. Turns out, you can buy liquor at the gas stations in Louisiana and folks were obviously buying. Suddenly a little nervous about my choice of stops, I quickly got back on the bike and hit the starter. Errrrr errrrr errrr…nothing….errrr errr errr…crap. One guy walking out of the store politely reminded me to turn the choke on, which I less than politely informed him it didn’t have. Errr errrr errr I twist the throttle and it fires up (BMW owners, slap your forehead’s “here”) only to have it die again once I release the throttle. Why do bikes always decide to be fussy at the most inopportune times? Okay I can deal with fussy bikes, I’ve owned numerous Jap bikes that were fussy. So I hit the starter and again twist the throttle, only this time when it fires, I don’t let the RPM’s drop far enough to let it die. I just keep the throttle open a bit and I’m off. Once on the interstate, she’s humming along again as if nothing had ever been wrong. But it’s getting dark faster than it should and I would need to find a hotel with food and gas nearby incase she didn’t want to start again in the morning. Also, I needed to get as close to home as possible, in case Dan had to drive out and rescue me. I used the Scala (with the Bluetooth in my phone) to call Dan again and explain what the bike was doing. 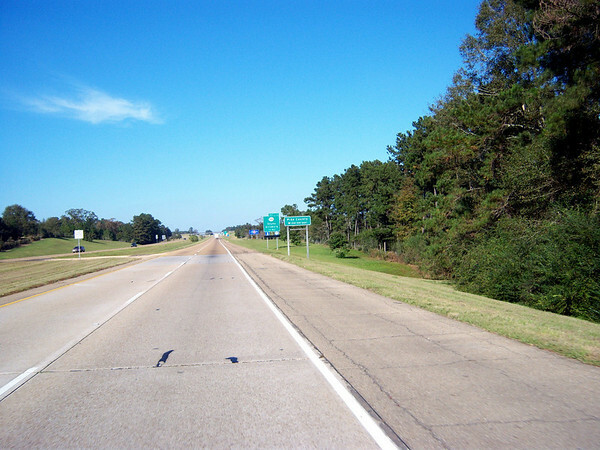 We both agreed, that with the gas I had, I should be able to make it to Vicksburg, Ms. Dan looked up a hotel online that had lots of food and such around it. Meanwhile it was definitely past dark and I had started seeing deer along the interstate. Time to get to the hotel and call it a night. This was the only point in my trip where I got anxious. I realized I was by myself, in the dark, in the middle of nowhere in the dark and what was I going to do should the bike break down now. I have AAA so started REALLY paying attention to the exit and “mileage-to” signs along the interstate. Just in case. Now as is always the case when you’re having engine troubles, I hit road construction coming into Vicksburg. I was on the Scala-phone with Dan, so he could tell me where to go off the exit, when the lanes merged into one. There was a truck to my right and I knew it had to get in front of me. Not wanting to play I decelerate to allow him plenty of room. Apparently, he missed merging school and decelerated as well. Crap, c’mon dude! What’re you doing?! I hit my brakes as he creeps over…and the bike dies. Great! Now I’m on the interstate, in the dark and the bike is dead. Not the best scenario by far. Hoping against hope, I pull in the clutch and let it go. It works, the bike fires back to life, but now I’m more nervous than ever. I want off this interstate NOW! Good thing my exit was just ahead. Again I keep the RPM’s up as I pull into the hotel, but as soon as I roll off the throttle, she dies. I tell the clerk to give me a ground floor room, as close to the office as possible, just in case I have to push the bike to the room. Fortunately, I twisted the throttle and she started again and took me to my room. BTW funny how bike problems make you instantly forget how cold you are while riding. 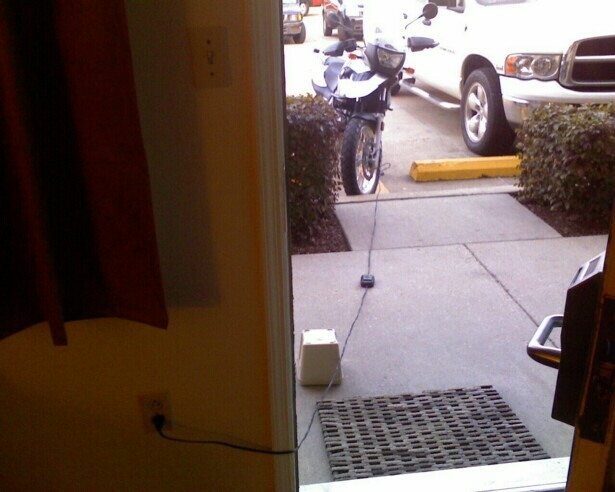 Dan had wanted me to try to get the bike into the room, but the 3 inch curb prevented that..atleast for me. And there were no handicap ramps nearby. So she would be spending the night outside. Tired, cold, stressed and trying to figure out what was making my bike “sick” I walked up to the Waffle House aka The Awful Waffle, for some dinner. I get there only to be informed that they are cleaning the grill and it’d be 30 minutes. I ask if it’ll be 30 minutes for a waffle and she says no, so I order a waffle and some decaf. It wasn’t good. Once back at my room I talk with Dan again and we’re going through the laundry list of things that “could” be wrong with my bike. Unfortunately we wouldn’t know if it was going to start again or not until the morning. I kept thinking it had to be something simple. I couldn’t remember if I had let all the blinking lights go out before hitting the starter back in Louisiana. Perhaps the computer just needed reset, but how to do it? Thank goodness for the internet on my Palm. 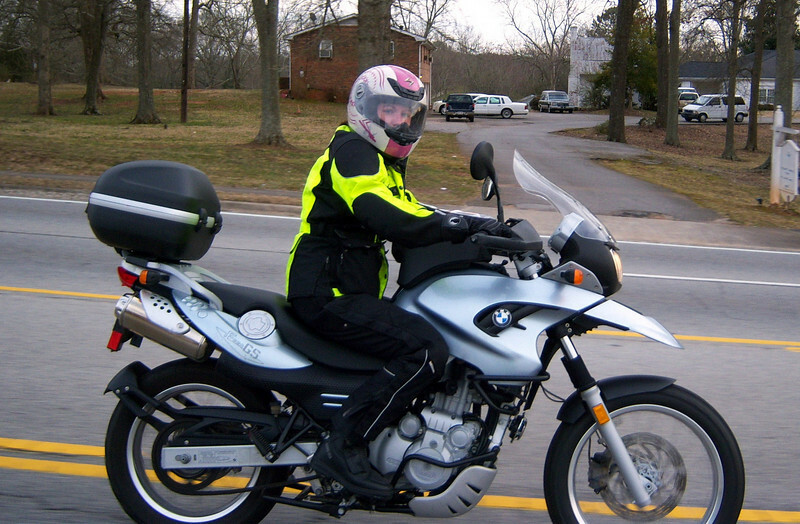 I logged onto the best place to find answers for all my F650GS questions. The F650 forum aka The Chain Gang. I searched through starting issues and there was the obvious answer and the fix. My bike wouldn’t idle because I had hit the throttle while starting it. D’oh! 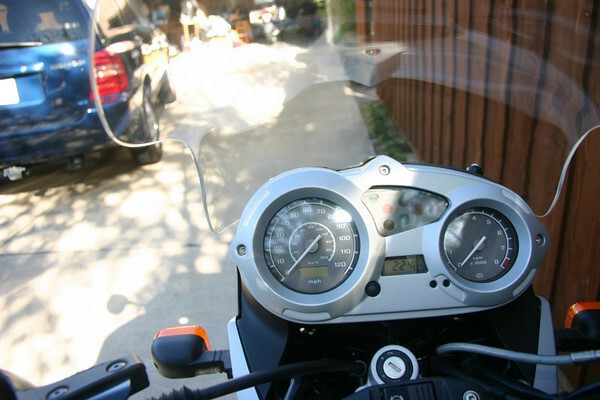 The bike thought that wherever the throttle position was upon starting, was the “closed” position. The fix, even simpler….turn the key on, waiting for the abs light to quit blinking, then open the throttle 3 times, each time letting it return to full close on it’s own. Turn the key off again and wait 20-30 seconds. Bike should start right back up and idle fine afterwards. I had remembered reading this before and even remember a friend talking about this very same thing. But it’s funny how important info leaves your mind the instant you need it. Still not 100% convinced it will work, but with nothing to lose by trying it, I settle in for the night. At least I had something to try in the morning. I think I woke up every two hours that night to look outside and check on my bike. There’s that BMW induced paranoia again. Also the night before I had been reading the owners manual again and found the plug to charge the battery was already built into the bike. Another worry, since the battery was already dying and it was cold that night. Dan had also thought ahead and packed me a special BMW socket and Battery tender. So I woke up about 5:00 the next morning and got the bike close enough to plug her in. This is where I also found out, that as long as you’re a cute chick with a motorcycle, you can get away with anything. People would walk over my “trip wire”, but upon seeing me would just smile and say “good morning.” I’m sure if it were a guy’s bike, they’d have said something else. One lady even had to walk around another car to get her luggage in, due to my close proximity to the curb. I offered to move my bike, but she told me not to even worry about it and to have a good morning as well. Cool. Check out wasn’t until 11:00 and I wanted to give my bike as long as possible to charge, but by 9:00 I was getting “antsy” and started loading up. Fingers crossed, I did the “three throttle fix”…and it worked. I’m sure I “woo hoo’d” in joy as she sat there idling happily. I quickly packed away the battery tender and was off to the gas station, where I let it idle while filling it up. Just in case. I was back on the road and headed for home. The sun was up the day was good ….. and my fuel light was on. WTF?? I guess when it came on before I filled up, since I didn’t shut the bike off, the computer didn’t reset. I’d just have to watch my miles. The forecast said it was going to get up to 68, but not anytime soon. I had planned on a 200 mile stint with a stop for gas and lunch. And this time, if I she wouldn’t start again, at least I was just a tad over 200 miles from home. I had been talking to Dan off and on, basically telling him, “if it didn’t start, I’ll call you, if it does, you’ll see the spot moving.” So he was happy to see me truckin along. His dad had also headed to our house with his truck, just incase this turned into a rescue mission. 200 miles later I was in nowhere Alabama. Tuscaloosa was 30 miles ahead, but not knowing how good I was on gas, I didn’t think I would make it. I finally stopped at the Union exit for gas and a Slim Jim. Not the lunch I had imagined, but better than nothing. But I made it to Ga and familiar roads. I felt such a huge relief when I finally exited the interstate. I was finally home. It was actually hard to slow down to 45 after riding nearly 800 miles at 80mph. 10 miles from home, I spot Dan in the other lane riding out on the 650r to greet me, so I pull over and let him turn around. Our Scala’s sync up and I ask if he wants to ride it to dinner and of course he says yes. I climb on the trusty ninja and was like ugh. My legs are too cramped up and man am I sitting forward. This isn’t comfortable at all. In fact, the only nice thing was the seat. I guess once you go Beemer, you can never go back. Dan however isn’t digging the Beemer so much. He hates the seat and stated the bike felt too small. But like the throttle response and power. Oh well, at least I don’t have to worry about him borrowing it all the time. We gave up long ago on finding bikes that would fit both of us. He’s 6’4”, I’m 5’4” we’re just too different. But that’s why they make so many different bikes. And this one fits me perfect. We head off to get some grub and reconnect after my weekend adventure. Dan fortunately had the camera and took some return pics of me on my new bike. I got that “rider’s smile”. Can ya tell? Cannot see exactly through the full face helmet, but yes anyone on a new or hardly used BMW would have a smile on their face.Not up here in Canada for we have a thing called WINTER that includes snow.Some end of October we WINTERIZE our bikes & will not be riding till late May or mid June.So a very short riding season if you lived in Canada.